At its October 4 launch event, Google is surely going to introduce numerous hardware and, of course, its flagship smartphone duo of Pixel and Pixel XL. After the early reports suggesting Google may also launch a Chromecast Ultra that will support 4K video streaming, the leaked images of the dongle have come in now. The images were leaked online in a tweet by prolific tipster Evan Blass, and they detail how Google’s new Chromecast Ultra will look. Looking closely at the image, the 4K Chromecast Ultra looks like the new Chromecast aka Chromecast 2 dongle in black colour. The most noticeable difference is the lack of Chrome branding. It has been replaced with the new Google ‘G’ logo, as seen on the company’s software products. 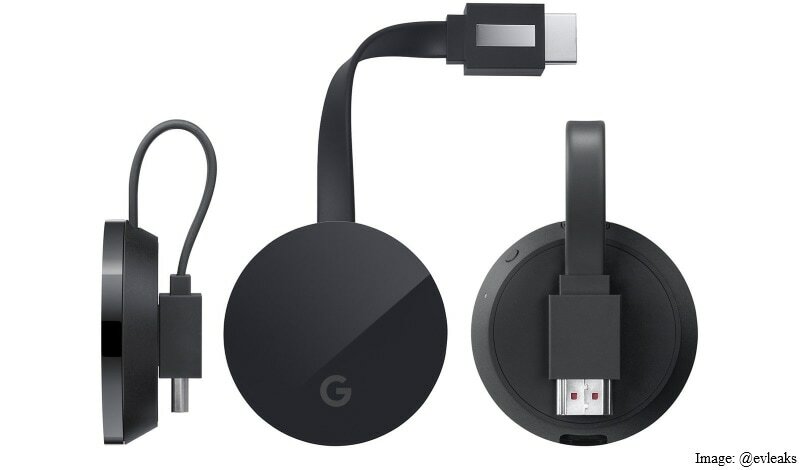 Just like the Chromecast 2 dongle, it is shaped like a hockey puck with a ribbon-like HDMI cable that attaches itself to the back with a magnet. As reported by VentureBeat, the 4K Chromecast Ultra dongle will run on firmware version 1.21, which was recently rolled out under the Chromecast preview programme. The Chromecast preview programme essentially gives members an early access to features and improvements on their Chromecast dongles. In addition to supporting 4K videos, the new Chromecast Ultra dongle will also feature support for HDR. A new on/off or restart switch also appears to be present in the new 4K Chromecast Ultra. It will go on sale along with the company’s already selling HD supporting Chromecast 2, which is priced at $35 (that’s Rs. 3,399 in India). The new Chromecast Ultra, as we reported earlier, is pegged to be priced at $69 (roughly Rs. 4,600), which is a bit higher and almost twice the price of its previous generation device & considering other Android casting devices. To recall, Google is set to launch multiple products including Google’s own branded Pixel smartphone duo, the Google Home assistant, and the Google Wifi router, and may make significant announcements at its grand October 4 event – including possibly an unveiling of Google Andromeda OS. Nintendo to End Wii U Production. Possible Nintendo NX Release Date Soon?